There has always been a place in comics for the little guy, and few came any smaller than DC’s Atom—or rather Atoms! The first Atom premiered in All-American Comics #19, in late 1940, and very soon afterward began appearing as a member of the Justice Society in All Star Comics. The young Al Pratt, a student at Calvin College, is tired of being teased about his diminutive stature, and to impress his sweetheart Mary James, he vows to transform his body into something more presentable. Through intensive training with former boxing champ Joe Morgan, he is soon immensely powerful. After donning a brown-and-yellow weightlifting costume (complete with straps and buckles), with a blue cowl and cape, the Atom starts a one-man crusade against crime and injustice. 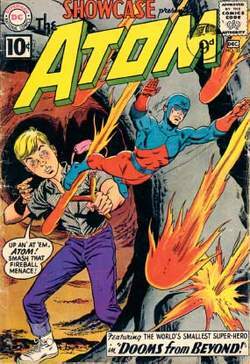 Without doubt, the Atom was one of the most uncomplicated characters of the Golden Age of comics (1938–1954); he had no superpowers, secret hideouts, sidekick, weaponry, or gimmicks. What the strip had, particularly when drawn by the gritty Joe Gallagher, was a sort of down-to-earth honesty, as the hero took on a variety of hoodlums and gangsters in a succession of short, punchy yarns. Considering how basic the feature’s premise was, it is surprising that the Atom was to prove so enduring, but he outlasted many of his more flamboyant colleagues. He starred in more than fifty issues of All-American Comics and, when he was ignominiously displaced from that title he moved right on over to Flash Comics for a few more years’ worth of strips. In All Star Comics he was to prove one of the most enduring members of the Justice Society of America, starring in almost every story until the comic’s demise in 1951. By this time, he had undergone a radical revamp in which he had somehow acquired “atomic strength” and sported a new costume, topped off with a fin on his head. Al Pratt’s Atom was next seen, along with the rest of the Justice Society, a decade later in the 1960s, but only as an occasional participant in their adventures, perhaps because another Atom had been created in his absence. Following the success of the Flash and Green Lantern, DC editor Julius Schwartz was looking for another Golden Age character to revamp when artist Gil Kane brought in some new designs for the Atom. Kane was inspired by Quality Comics’ Doll Man, and his Atom update was similarly a hero who could shrink himself down to an almost microscopic size. Over three issues of Showcase in 1961 and 1962, Schwartz, Kane, and writer Gardner Fox introduced physics professor Ray Palmer, whose experiments with fragments of a white dwarf star enable him to shrink almost at will. After discovering that his best size is six inches, Palmer dons the requisite red-and-blue superhero costume and embarks on a clandestine career as a crime fighter. Schwartz and Fox had solid backgrounds in science fiction, and consequently the Atom’s adventures were frequently based on some sort of scientific conundrum or another, be it a natural disaster, or a trip back in time to meet Jules Verne or Edgar Allen Poe. When shrunk, the Atom had increased physical strength but was still something of a lightweight compared to heavy-hitters such as Superman or Wonder Woman, and so his villains, like Jason Woodroe, the Plant Master, or the stripy-costumed Chronos, also tended to be second rate. In civilian life, Ray Palmer was courting the pretty lawyer Jean Loring, but the pair acted more like a middle-aged couple than young lovers, and the feature as a whole, though beautifully illustrated, was ultimately rather dry. After thirty-eight issues of his own title (including two guest appearances from his Golden Age counterpart) and six more co-headlining with Hawkman, the Atom was relegated to a backup slot in Action Comics. Throughout the 1960s and 1970s, the Atom (by now married to Loring) was a regular member of the Justice League of America, and that seemed to be enough for most fans, few of whom were clamoring for a new Atom comic. However, Gil Kane still fondly remembered his creation and, together with writer Jan Strnad, brought out a miniseries, Sword of the Atom, in 1983. After finding out that his wife was having an affair, Palmer flew out to the Amazon, where he discovered a tribe of diminutive, yellow-skinned barbarians, which he promptly joined. This new direction, which continued in a series of specials throughout the 1980s, owed more to Conan the Barbarian than a regular superhero book and was surprisingly well written. However, a subsequent 1988 regular series was a more pedestrian retread of the 1960s version and interest once more died out. The 1990s brought an appearance in the Zero Hour miniseries, and a rather unexpected transformation: the now resolutely middle-aged Palmer was bizarrely changed into a seventeen-year-old. The teenage Palmer did the only logical thing a teenage superhero could do: He joined DC’s all-purpose kid group, the Teen Titans. In 1997 the Justice League was relaunched with its original 1960s lineup, including, of course, the Atom, with his temporary youthful transformation apparently forgotten by everyone, including the comic’s creators. molecule, the corpuscle and the atom in that it is an ion. After the realisation of Bose-Einstein-Condensation a next milestone will be the realisation of a laser like device for ~bosonic atoms~, the atom laser. Throughout the universe, the smallest whole unit in life is the atom. When the tip was moved back and forth with the atom trapped underneath, a recurring scratching sound was "heard" as the cobalt atom hopped between the unfavored and closest, energy-favored site. a] = 0, where we have assumed that the atom labeled "a" has been excited. TEHRAN (FNA)- Researchers succeeded in an experiment where they get an artificial atom to survive ten times longer than normal by positioning the atom in front of a mirror. To do so, the researchers first created a quantum-information bridge between a different, brilliant laser pulse and the atom cloud. But, in the words of Wolfgang Ketterle, the Massachusetts Institute of Technology physicist who led the atom laser team, ``It will never be used in supermarket scanners or CD players. Then, by crossing two laser beams to form thousands of light tubes capable of confining atoms, the team divvied up the atom cloud into a hundred-or-so atoms per tube. The molecule easily scarfed up as many as five loose copper atoms and then delivered the atom cluster to a desired location, the team reports in the December Nature Materials. AtomFilms is simultaneously debuting the Atom Mavericks Program -- a grassroots marketing program that allows Atom enthusiasts to host short film screenings and promotions like The Journey Tour. The ATOM ES (external storage) solutions provide an easy way for users to secure valuable data stored on a laptop computer hard disk through a simple PCMCIA card interface.